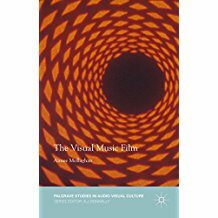 When I started to explore the topic of audio visual composition and started to use the term 'visual music' in 1999 to describe my own practice and research, there were very few books on the topic of Visual Music as such. However, there is a very rich source of texts in Journals on particular areas of practice and related areas of research and the term visual music did come forth in these journals, but was not prominent. I started to gather these articles as they were precious sources of information about other people's work and research and very exciting to learn about. The term itself came to prominence with the publication of the catalogue 'Visual Music' for a major Visual Music Exhibition held in the US. Now there is a growing literature in the field. Here are some recent and forthcoming publications. "The Visual Music Film explores the concept and expression of musicality in the visual music film, in which visual presentations are given musical attributes such as rhythmical form, structure and harmony. The role of music has, in general, been neglected when analysing visual music textually. To scrutinise these texts, The Visual Music Film interrogates them not only in terms of their existence as moving pictures but also gives equal weight to their aural aspect, considering them in terms of specifically musical parameters. Drawing on the disciplines of film theory, art history, music theory and philosophy, this book takes an interdisciplinary approach to investigating the measurable influence that wider contextual, philosophical and historical developments and debates in these areas bore on the aesthetics of specific visual music films." "Visualising Music explores alternative models of music-image relationship in film and video art, investigating how the boundaries of cinema can be challenged, both practically and theoretically, by a redefined audio-visual interaction. The first half of the book considers the significance of music in several types of non-Hollywood film, including the work of Werner Herzog and Derek Jarman. Building from here, the second half explores the expanded spaces of video installation art, with close reference to the immersive musical sites of Bill Viola." "Offering historical and theoretical positions from a variety of art historians, artists, curators, and writers, this groundbreaking collection is the first substantive source book on abstraction in moving-image media. With a particular focus on art since 2000, Abstract Video addresses a longer history of experimentation in video, net art, installation, new media, expanded cinema, visual music, and experimental film. Editor Gabrielle Jennings - a video artist herself - reveals as never before how works of abstract video are not merely, as the renowned curator Kirk Varnedoe once put it, "pictures of nothing," but rather amorphous, ungovernable spaces that encourage contemplation and innovation. In explorations of the work of celebrated artists such as Jeremy Blake, Mona Hatoum, Pierre Huyghe, Ryoji Ikeda, Takeshi Murata, Diana Thater, and Jennifer West, alongside emerging artists, this volume presents fresh and vigorous perspectives on a burgeoning and ever-changing arena of contemporary art." "This comprehensive monograph celebrates the visual art of renowned musician Brian Eno. Spanning more than 40 years, Brian Eno: Visual Music weaves a dialogue between Eno's museum and gallery installations and his musical endeavors�all illustrated with never-before-published archival materials such as sketchbook pages, installation views, screenshots, and more. Steve Dietz, Brian Dillon, Roy Ascott, and William R. Wright contextualize Eno's contribution to new media art, while Eno himself shares insights into his process. Every copy includes a download code for a previously unreleased piece of music created by Eno, making this collection a requisite for fans and collectors." "The different techniques of realization and presentation of audiovisual art, the thought of the protagonists and the results of their artistic research. What links exist between sounds and abstract images? What were the first audiovisual instruments? What was the influence of music on Kandinsky�s work? What are the most relevant audiovisual installations? What are the relationships between VJs and live cinema? And, what is synesthesia? Masters of Visual Music answers these and many other questions concerning the relationship between art and music, spanning from Toulouse-Lautrec to Nam June Paik, from H�ndel to Xenakis, and from Wilfred to Kurokawa. It is an in-depth study focused on both historical experience and contemporary research, illustrated by 150 colour images." "Becoming commercially available in the mid 1960s, video quickly became integral to the intense experimentalism of New York City's music and art scenes. The medium was able to record image and sound at the same time, which allowed composers to visualize their music and artists to sound their images. But as well as creating unprecedented forms of audiovisuality, video work also produced interactive spaces that questioned conventional habits of music and art consumption. This book explores the first decade of creative video work, focusing on the ways in which video technology was used to dissolve the boundaries between art and music." Starting PointsMethodologiesReciprocation � the musical in visual culture and the visual in musical cultureConvergence �in metaphor, in conception, and in practiceHybrid Arts"
"Music has inspired some of the most progressive art of our time from the abstract painting of Wassily Kandinsky and Frantisek Kupka to the mid-century experimental films of Oskar Pischinger and Harry Smith to contemporary installations by Jennifer Steinkamp and Jim Hodges. While early abstract paintings tended to approach music metonymically, the colour organs, films, light shows and installations from midtwentieth century to the present day engage a range of perceptual faculties to create a plethora of sensations in the viewer.The most complete examination of this phenomenon to date, "Visual Music" features ninety major works of art plus related documentation, focusing on abstract and mixed-media art forms and their connections to musical forms as varied as classical, jazz and electronica. The book includes three scholarly essays, each discussing a distinct art historical period in depth, and an additional essay by Olivia Mattis that approaches the subject from a musicologists perspective, as well as a chronology, artist biographies and a selected bibliography." "Composers and artists have always borrowed from each other. Peter Vergo, for the first time, offers an in-depth study of how and why, in the modernist era, music and painting became intertwined. Artist-composer relationships examined include Debussy's interest in Whistler, Tuner, and Monet, Franz Liszt's fascination with Raphael and Michelangelo, Kandinsky with Schoenberg and Paul Klee's influence from Polyphonic music. How artists attempted to translate musical rhythms, and structures into painting and how musicians developed visual themes, all within the backdrop to modernism, as time of huge change in freedoms, industry, expression, ideological frameworks, and artistic practice." "Painters and musicians have always found inspiration by sharing ideas from both disciplines. How this relationship developed from Philipp Otto Runge's "compositions" in painting to Jean Tinguely's and Niki de Saint Phalle's musical sculpture is the focus of this volume. Selected images and quotations from composers and artists are blended into this study. Runge and Richard Wagner recognised the interdependency of music and art in the creation of abstract, symbolic language. However, as in the work of Matisse, the figurative representation of musicians or instruments soon developed into a structural relationship between sound and color. By the 1960s the two arts, represented in particular by Jackson Pollock and John Cage converged in the Fluxus "happenings" where participants such as Joseph Beuys and Yves Klein sought to push back the boundaries of modern art . In the 1990s the sculpture of Pol Bury or Takis contunues the quest to make sound tangible and new digital technologies have introduced even further possibilities." "This handbook offers new ways to read the audiovisual. In the media landscapes of today, conglomerates jockey for primacy and the internet increasingly places media in the hands of individuals-producing the range of phenomena from movie blockbuster to YouTube aesthetics. Media forms and genres are proliferating and interpenetrating, from movies, music and other entertainments streaming on computers and iPods to video games and wireless phones. The audiovisual environment of everyday life, too-from street to stadium to classroom-would at times be hardly recognizable to the mid-twentieth-century subject. The Oxford Handbook of New Audiovisual Aesthetics provides powerful ways to understand these changes. The book provides a definitive cross-section of current ways of thinking about sound and image. Its authors-leading scholars and promising younger ones, audiovisual practitioners and non-academic writers (both mainstream and independent)- open the discussion on audiovisual aesthetics in new directions. Our contributors come from fields including film, visual arts, new media, cultural theory, and sound and music studies, and they draw variously from economic, political, institutional, psychoanalytic, genre-based, auteurist, internationalist, reception-focused, technological, and cultural approaches to questions concerning today's sound and image. All consider the aural dimension, and what Michel Chion calls "audio-vision:" the sensory and semiotic result of sound placed with vision, an encounter greater than their sum."